Justus Graham Barnes: Baptized into His name on Easter, March 31, 2013. Justus is pictured with his parents, Justin and Jennifer Barnes and one of his godparents and also his Aunt, Denise Woodward. 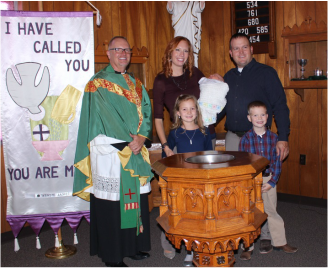 Ayzlee Haertel received Holy Baptism. Holy Baptism works forgiveness of sins, rescues from death and the devil, and gives eternal salvation to all who believe, (Matthew 28:19; Mark 16:16; Acts 2:38-39; 22:16; Romans 6:3-11; 1 Corinthians 6:11; Galatians 3:27; Ephesians 5:26; Titus 3:5-8; 1 Peter 3:21). What great joy! Brooklyn Abigail received the gift of Holy Baptism on August 16, 2009. Brooklyn is pictured with her parents, godparents, and Pastor Kuhlman. Dylan Rae with godparents on her baptismal day May 3rd, 2009.